Culligan Franchisees - Amplitude Design, Inc. The site design collaboration between Kennedy Communications, Twist Communications and Amplitude Design, Inc. of Madison, is now benefiting over 100 Culligan franchisees across the country. We would love to demonstrate for you how we were able to develop a content management system that was flexible enough to be quickly tailored to the franchisee’s individual markets, while maintaining the brand. Amplitude Design, Inc. is proud of its execution on the project. 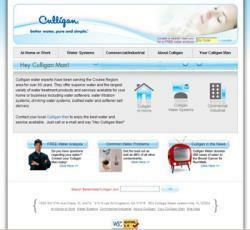 We were able to fulifill the needs of the client, and provide a scalable solution for the Culligan franchisees. To reach Amplitude Design, Inc. or its staff please click here.